This paper describes a flexible workflow for generative design applied to architectural space planning. We describe this workflow through an application for the design of a new office space. First, we describe a computational design model that can create a variety of office layouts including locating all necessary programs and people using a small set of input parameters. 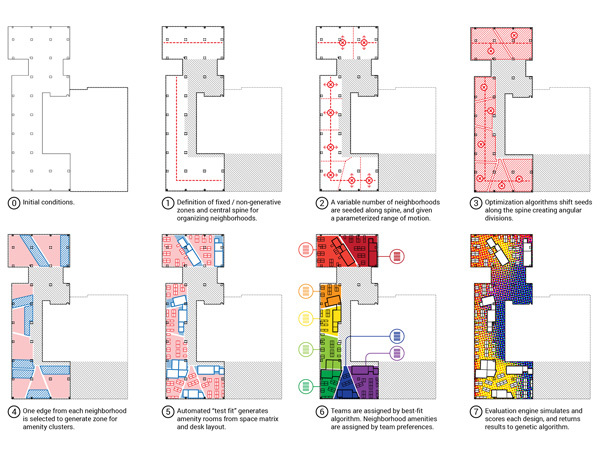 We then describe six unique objectives that evaluate each layout based on architectural performance as well as worker-specific preferences. Finally, we show the use of a multi-objective genetic algorithm (MOGA) to search through the high-dimensional space of all possible designs, and describe several visualization tools that can help a designer to navigate through this design space and choose good designs. We conclude by discussing the future of such computational workflows in design and architecture. Our hope is that they go beyond basic automation to create an expanded role for the human designer and a more dynamic and collaborative interaction between computer design software and human designers in the future.